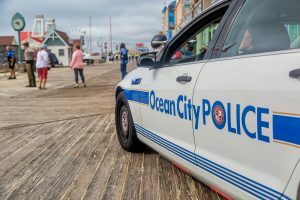 OCEAN CITY — A high-speed chase in the resort last month that resulted in a collision with an Ocean City Police Department (OCPD) vehicle raised eyebrows for some in the community about the use of License Plate Reader (LPRs) technology to identify suspects, but the city has assured the public the system is not used for nefarious purposes. In mid-November, an LPR on eastbound Route 90 alerted on a wanted individual entering Ocean City. A traffic stop was initiated, resulting in a high-speed chase that culminated with the suspect crashing into a marked OCPD vehicle and injuring an officer. As it turned out, the driver was wanted in a lengthy DEA case involving drugs and weapons and he was subsequently arrested and charged. Despite the good outcome in that case, some in the community questioned the use of LPRs at each of the entrances to Ocean City and their potential misuse, implying the OCPD and presumably other law enforcement agencies were using the plate-reading technology for less than above-board purposes, evoking big brother implications. As it turns out, the LPRs do track every vehicle and tag number entering the resort, but that information is highly protected and utilized by law enforcement in only special circumstances under strict guidelines. OCPD Communications Director Lindsay Richard explained some of the uses for the LPRs and how the information is stored and utilized on rare occasions such as last month’s high-speed chase and collision that resulted in the apprehension of a wanted suspect in a federal case. Richard explained the OCPD cannot simply peruse the lists of vehicles and tags entering and exiting the resort without a specified purpose. Richard explained the OCPD only utilizes the LPR technology in specific cases where its use can aid in a serious investigation. According to Richard, the LPRs can be used for a variety of other purposes not always crime-related. Ricard cited another example when an LPR was utilized to locate a missing person under emotional distress.